The Mt. 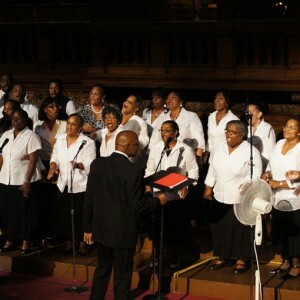 Calvary Baptist Church Adult Choir was founded by Rev. George D. Bullock, Sr. over 40 years ago. Formally known as the Mt. Calvary Junior Choir, it consisted of approximately 15 teenagers and one 4 year old, Edmund Bullock. Rev. Bullock, his father, sensed the call of God to the music ministry on his life and allowed him to become a member at this tender young age. Edmund is now the Choir Director, which consist of writing songs, conducting music workshops, vocal training, and the likes. Because God was revealing His plan to Rev. Bullock, Sr., he released himself of all obligations to the choir. His training the youth allowed him to pass this torch with confidence that the ministry would thrive. The president of the choir is Grace A. Hampton, who has been a member of the choir for 36 years. The mission statement is to strengthen and edify through original heavenly music. Its membership consists of those who sense the call of God to inspire worship at home and in the community, as well as to evangelize the world. By God’s grace, through these years, the ministry has remained fruitful. Praise the Lord! For it is good to sing praises to our God; For it is pleasant, and praise is beautiful (Psalm 147:1). To God be the glory.